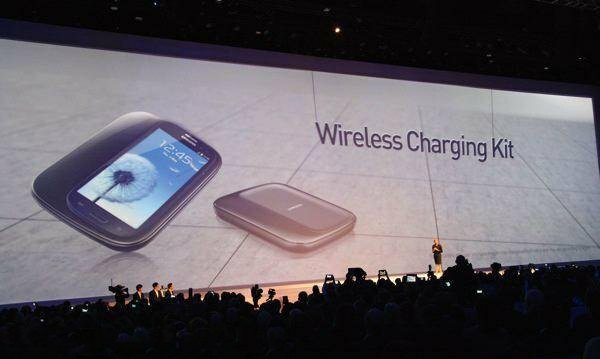 Samsung is working on magnetic resonance wireless charging technology, with first products to launch next year. The development of wireless charging has been plagued so far by high-costs, immature technology, and competing standards. Currently, industry players have grouped around two technologies, inductive magnetic charging and resonant inductive magnetic charging, but only the former has made it into actual products, in the form of the Qi wireless charging standard. As the largest smartphone maker in the world, Samsung has a big influence over the development of wireless power transmission, and it looks that the Korean giant is betting on magnetic resonance technology. Samsung recently acquired a stake in Power by Proxi, a supporter of the Qi standard that specializes in magnetic resonance power technologies. But Samsung is also developing magnetic resonance chargers internally, and plans to commercialize the technology by the middle of 2014. According to a “Samsung insider” cited by the Korean IT news portal ETNews, the company actually tried to equip the Galaxy S4 with magnetic resonance charging, but cancelled the feature after it malfunctioned in tests. However, Samsung has ironed out some of the wrinkles: “the magnetic resonant reception chip performance has been improved to be suitable for system application,” said the insider. Why is magnetic resonance charging important? Because it allows for charging at a distance, unlike the current Qi standard, which requires the phone and the charger to be very close and properly aligned. In other words, instead of having to place your phone on a charging mat or on a charger like in the case of the Nexus 4, with magnetic resonance chargers, you’ll be able to place your phone anywhere near the charger, without having to carefully align it. Depending on the implementation, magnetic resonance technology should enable charging at distances of several inches or more. Check out this overview for more info on wireless charging, the difference between inductive and resonant magnetic charging, and the competing standards that support them. I hate cords with a passion. I write this while listening to my music in a set of bluetooth headphones (Rocketfish RF-MAB2). I use a cordless mouse both at home and at work. The rear satellite speakers of my home surround sound system are connection via RF to my the rest of the system, so no wiring crossing the room. I use WiFi on all my A/V devices. In the next few years, once I can say that the TVs and Bluray players are old and outdated, I’ll invest in WiDi. So, this is good news to me. It means the possibility of eliminating power cables. Nevermind using this tech for charging phones and tablets, use it to power everything, including devices that use no batteries! Once the technology improves and matures, you could plug a magnetic resonance box into the wall, and the nearby TV, audio equipment, etc can all draw power from the it.